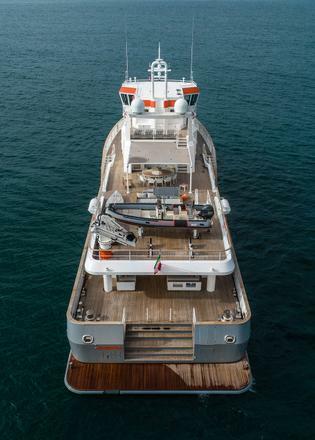 With her grey hull and orange boot stripe and extraordinary beam, her bridge that looks like a scaled down version of the pilothouse on a cruise ship, and enough range to cross the Atlantic several times without refuelling, Genesia has plenty of character. 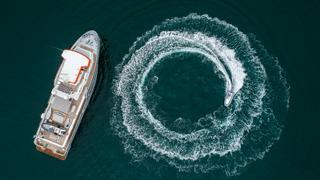 The 2018 World Superyacht Awards winner for Best Rebuilt Yacht is a new boat but one with a former life, transformed by an owner with an original vision for his first large motor yacht. He named the boat as a tribute to the woman who has been caring for the family’s children for decades. “She is a very solid, spirited woman and nanny and the whole family is very attached to her,” he says. Although the process was anything but ordinary, the project started in a conventional way about four years ago when the owner asked Vallicelli Yacht Design of Rome, a design and architecture firm he knew well, to come up with a concept for a new boat. The owner and designers have common interests. “Andrea Vallicelli is an old friend of mine, who did a lot of sailing boats and designed one of the first Italian America’s Cup boats,” he says. A concept that Vallicelli Yacht Design drew caught his attention but he wanted to go in a slightly different direction. As Vallicelli’s design partner, Alessandro Nazareth, remembers the conversation a few years on, the owner said that he liked what they had come up with but wanted the feel of a ship, more authentic, and suggested they look for an existing work boat they could convert instead. The team began looking in earnest for a suitable candidate. “We asked all around the world,” Nazareth says. After months of getting nowhere, the designers finally had a promising lead. An Italian engineer, who worked in the commercial sector, pointed them to a shipyard in the south of Italy. 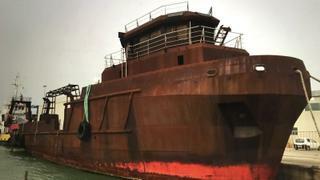 The Cantieri Navali Termoli shipyard was in bankruptcy and an administrator had been appointed to dispose of all assets, including a 36 metre hull and superstructure that was to be sold at auction. The partially completed project had been floated in 2005 and had lingered there since. When they saw the pictures, the designers worried this might be another dead end. “We were afraid he would say ‘let’s forget about it’.” However, it had some redeeming qualities. “Despite its condition, it was interesting, particularly its shape and volume,” Andrea Vallicelli says. “It looked like a monumental sculpture by Richard Serra,” he adds in jest. An Ievoli class supply vessel that had been designed for multiple uses including fire fighting and towing, it was far from ready for the kind of cruising the owner intended to do. Its vertical bow, designed to push other boats or get close to a floating platform, was not the most seakindly or fuel-efficient. The entire stern was closed off and provided no access to the sea. The pilothouse was wide but narrow, with no room for seating or a captain’s cabin. The engine room was enormous and encroached on what could be used as accommodation space. And, of course, there was no yacht-style interior at all: no guest cabins or galley, saloon or entertainment area. With a 10.3 metre beam, however, it was very voluminous, with huge fuel, water and ballast tanks. It would undoubtedly morph into a yacht with the strong commercial character the owner envisioned. In close consultation with the owner, they began working in earnest on naval architecture, on a general arrangement suitable for a private boat and on the restyling. To carry out the construction work, which included replacing some of the hull plates, the designers decided on a low-key shipbuilder and refit yard located on the Adriatic coast about an hour’s drive from Venice. 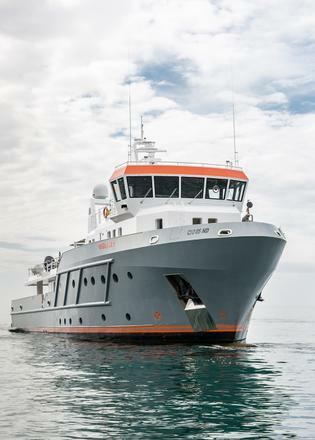 Named after the small town where it is located, Cantieri Navali Chioggia (CNC) has a background in tugboats and supply vessels, and in 2007 the yard began building trawler-style vessels marketed under the name Ocean King. A 26.6 metre Ocean King 88 came first in 2012, followed by two 30.5 metre Ocean King 100s. Like the boat the owner envisioned, CNC’s Ocean King series is rugged, beamy and solid. It seemed like the ideal fit and it took three days for the boat to reach Chioggia from southern Italy. Vallicelli Yacht Design worked on important modifications to make the boat seakindly and improve on fuel consumption, particularly the stern and the bow. “Tank testing showed a bulb was much better for fuel consumption,” Nazareth says. Reconfiguring the bow also helped to add usable volume. Some of that volume is for fuel and water tanks that carry 177,000 litres of marine diesel and up to 21,000 litres of fresh water, as well as ballast tanks that help maintain trim when the fuel load decreases. Sea trial results showed that the range at 10 knots can exceed 9,000 nautical miles and easily tops 10,000 miles at 8 knots. The stern was modified to create a yacht-like transom with stairs descending to a bathing platform from a huge aft deck saloon area. Because the boat is so beamy and stable, they had no concerns about adding weight on top, Nazareth says. That helped with the big job, which was to create an interior layout suitable for crew and guests. One of the only sections of the original superstructure that remains is the site of the new owner’s suite, on the upper deck. 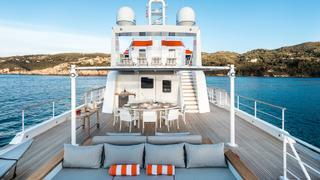 The full-beam suite, created with an en suite, also features a media room and an outer deck for dining and relaxing and/or toy storage, to create what is essentially an owner’s deck. Four large guest cabins and a generous crew area are split over the main and lower decks. To gain space below, the designers reduced the engine room footprint, moving a bulkhead by almost six metres to create space for guest accommodation. It remains an amazing two-level space (in a boat 40 metres long) with two commercial grade Caterpillar engines that look almost diminutive in the space. 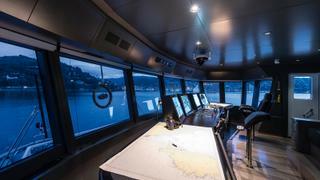 The owner felt a control room was a necessary feature on a globetrotting vessel, and there is ample room for it. Another area that received plenty of attention is the bridge, extensively modified from the original. The designers worked closely with the yard’s engineering team. “We did 3D models of everything – the piping, the propeller, the shafts, also the interior,” says Simone Vianello, an architect with CNC. The rebuild took about two years, including construction of a full interior mock-up. 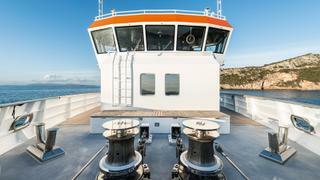 The entire boat is made from 12mm thick Grade A Fe-430 ship steel, chosen for its structural strength. CNC handled all metal and mechanical work and collaborated with an outside company on interior outfitting and electronics. When it came to finishing the boat, the owner and designers agreed on paint, employing a light fairing on the hull just to smooth it out, but decided against a typical yacht finish, while the superstructure was faired and painted white. Andrea Vallicelli initially suggested using a bright colour, such as lime, yellow or orange, for the hull, like some of the support vessels in the North Sea, but the owner preferred a masculine grey. However, they agreed on the bright orange on the bridge and boot stripe. Orange is one of the owner’s favourite colours. 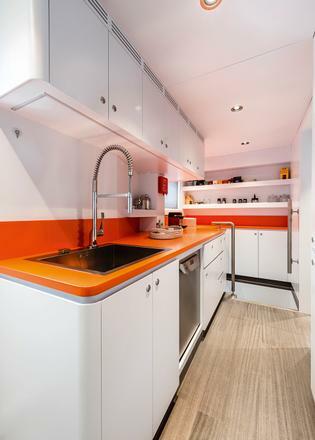 It is present in vibrant splashes throughout the interior, particularly the galley, which has a pleasant residential feel using orange Corian to frame Miele appliances. The interior is consistent with the exterior styling and in keeping with the spirit of a working boat. 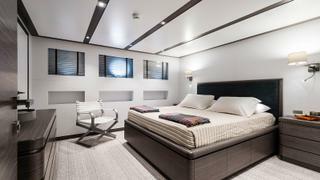 “I would not call it minimalist,” Nazareth says, but it is not an over-the-top yacht interior either. There are no thick marbles, ornate steelwork or wood carvings, not an ounce of onyx or crystal. However, it is elegant, practical and inviting. 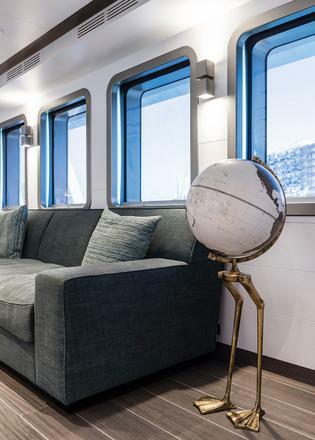 The windows on the main deck are framed, attractively, with wood covered with a nickel finish, which is also found on steel inserts between sessile oak planking on the floor and on the ceiling lights by Cantalupi, as well as on door knobs and taps. 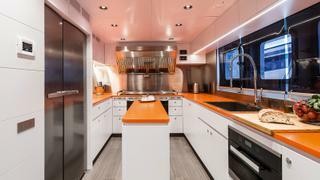 The bulkheads and ceilings are in a white lacquer that keeps everything modern and bright. Whimsical pieces, such as a pair of colourful crabs, and a piece by American multimedia artist Doug Aitken, decorate the ample and sparingly furnished spaces. “We worked with Andrea [Vallicelli] on the layout, but the decoration and the materials were all chosen by my wife. She has a great taste and I must say she did fantastic work. We also are very close friends with [acclaimed French designer] Jacques Grange and he gave us a few recommendations,” says the owner. The overall feel is that of a very personal, very comfortable boat where a family can enjoy extended stays. And thanks to the large boat deck, the owner can still enjoy sailing. In addition to a seven metre commercial-grade tender, the boat carries two sailing boats. He has made the delicate switch from sail to power with a solid and spirited expedition vessel that offers some of the best aspects of both worlds.